He’s been retired for four years yet former super-middleweight king Carl Froch still harbors ideas of fighting again. And yesterday “The Cobra” said he would be tempted to return to the ring to take on the winner of the soon to be settled World Boxing Super Series – whether it turns out to be George Groves or Callum Smith. Froch stated how the division he once ruled is “not that hot” at the moment and that current top dog (in his opinion) Groves is doing a good job. 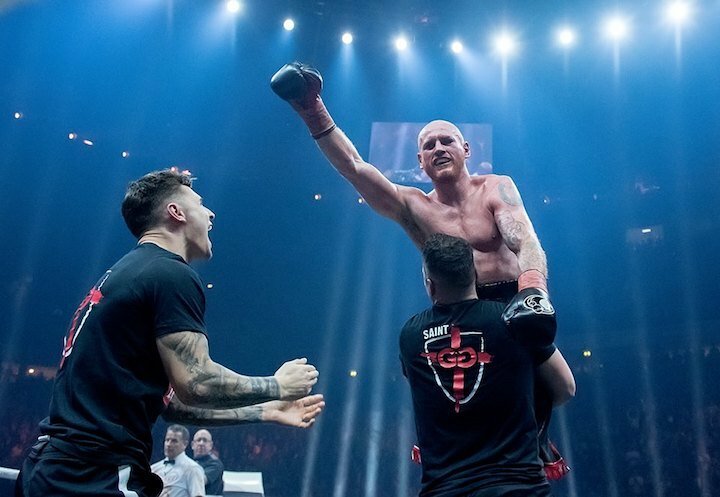 It was of course Groves who Froch had his last fight against, with the Nottingham warrior taking his tormentor and grudge rival clean out at Wembley. Now, Froch says, he wouldn’t even need much notice to be able to return and “take out” either Groves for a second time or the unbeaten Smith. Froch would shock many fans if he did actually return to the rigours of the ring. Having had his nose fixed via operation, Froch would run the risk of having his nose busted all over again if he did box again. At age 40, Froch has nothing at all to prove and it doesn’t appear as though he needs the money ( having invested well and having his job as a pundit for Sky Sports ). Still, the old adage in the sport is ‘They always come back,’ and maybe Froch, beaten only twice during his fine career, will become the latest former champion to prove such words to be nothing but true. Maybe Froch is bored and misses the adrenaline of the ring. Who knows, maybe Froch will do it one more time. Could he come back and defeat Groves for a third time? Would he gain enormous credit if he did so? Could Froch come back and hand the much younger Smith his first pro loss? Let’s see who wins the WBSS grand final in July before we reach an answer to any of the above questions. But if Groves and Smith engage in a gruelling war, it’s just possible Froch will be waiting for the winner. Froch has always kept himself in good physical shape, so who knows.